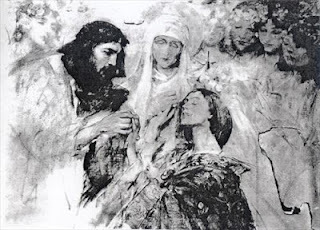 Kissing the Leper: What kind of woman.....? So...I beg you - it is my will in Christ Jesus - make your home in the pulpit of the cross. There be engulfed, lose yourself completely, with insatiable desire. Draw the red-hot knife and strike the devils, seen and unseen, who want continually to disturb your conscience by nipping people's fruit in the bud. Don't give in to this wicked devil - especially now, when it is time for harvesting and sowing. Tell the devil to deal with me instead of you! Forward then, courageously! St. Catherine of Siena was some kind of woman. I don't know the context of this piece, but she was a papal counselor. I don't know who received this, but what an incredible gift. Can you imagine calling the devil to yourself! I know she was doing this only under the greatest of necessity and she was very close to God - a stigmatist, a reformer, a saint. Do you have insatiable desire for the Cross? Are you ready to strike at demons? Are you giving in where you shouldn't? Forward then, courageously!